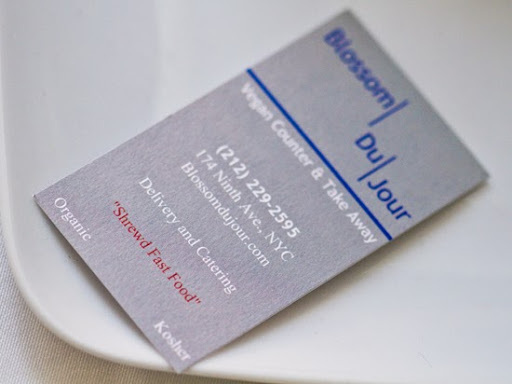 Blossom Du Jour Opens in NYC! 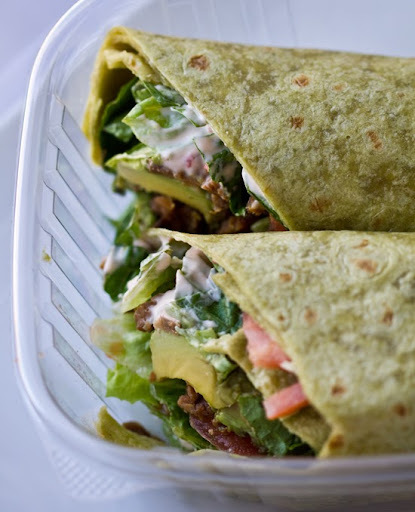 Vegan Fast Food. Pics! Buzz Alert! 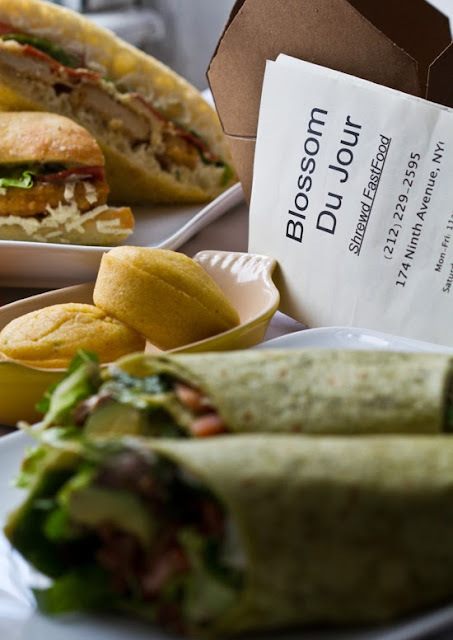 The hottest new vegan spot in NYC right now: Blossom Du Jour. 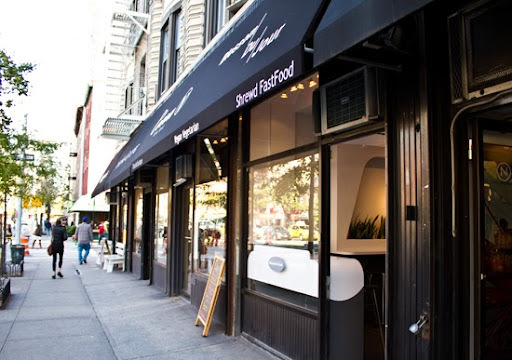 Blossom Du Jour (tagline: Shrewd FastFood) is the casual dining spin-off of the highly acclaimed, ultra-yummy, vegan NYC restaurant: Blossom. If you have ever been to the original Blossom Restaurant, you know how ah-mazing the food quality, taste and restaurant atmosphere is. Yes, I have spent many evenings dining and swooning at Blossom. -> But how will Blossom (vegan foodie mecca) do fast food?? My Blossom Du Jour taste test ahead..
Chocolate Coconut Pie: amazing! rich chocolate flavor. melts in your mouth. Vegan Stuffing: like homemade. cozy. Onion Rings: kinda small but the intense crisp-savory flavor makes up for it! Mac/Cheese: yummy smoky 'facon' flavor. It's rich and decadent. Super moist. Skyscraper: MrHHL loved this big veg burger. Midtown Melt: seitan wasn't as crispy as I'd hoped, but still really delicious flavors. Corn Edamame Salad: love the dressing! refreshing. Little Caesar Saldd: MrHHL loved this as well, creamy dressing, capers, perfect size for a small salad. ...see why everyone's buzzing?!.. 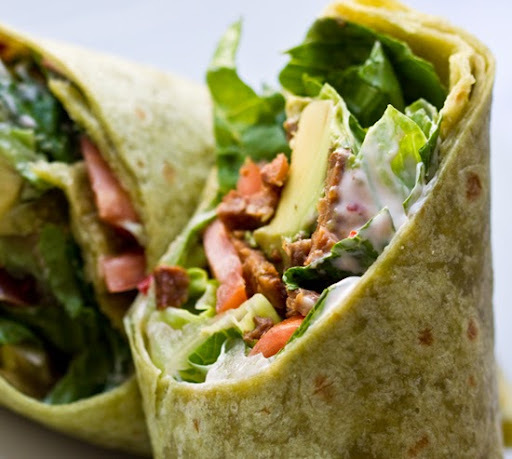 VegNews, Ecorazzi, Village Voice and even NY Mag's GrubStreet has been chattering about fast food, gone vegan. Or as Blossom Du Jour calls it: "Shrewd FastFood". So instead of read about it, I decided to get up early this Saturday morning and rush over to taste what all the fuss is about!.. 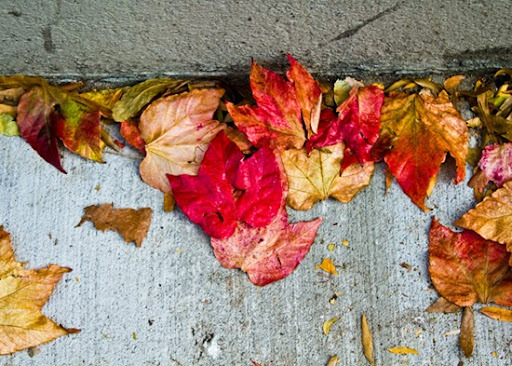 A lovely fall day in the city! A perfect stroll to venture to Blossom Du Jour..
My Trip to Blossom Du Jour. Let's go..
Around noon, my husband and I stumbled into Blossom Du Jour, which is located in Chelsea around 9th Avenue and 20th street. We were told we were the first customers of the day, which made me feel quite special since I love being the early bird. Interior: sleek polished white counters and slate gray accents. White and gray walls. Gray stone floor. A colorful, modern pastel clock graced the minimalist sidewall. It was casual-modern-chic. 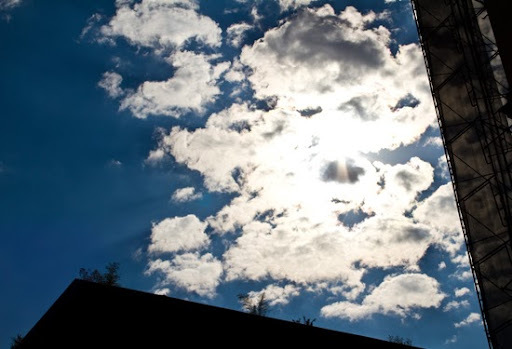 I felt like there might be a white spaceship out back. But in a good way. Kinda like The Jetsons. The cool green plants lining the bar were a refreshing outside-meets-inside touch. The restaurant is small, but has two long bar areas and probably seats around 10-12 people. But really, this place is take-out friendly with it's wall of grab-n-go refrigerators featuring fresh, raw-friendly salads, juices and more. 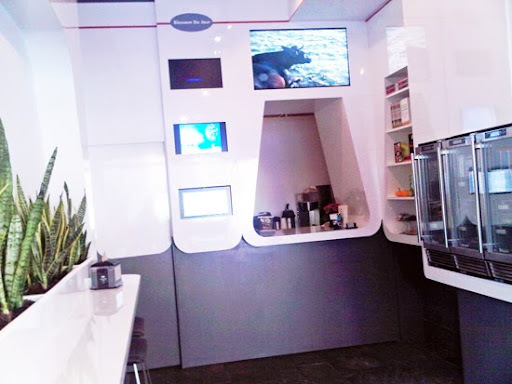 I loved the bright HD TV screen atop the ordering counter that flashed photos of Farm Sanctuary animals. Sweet pigs, fluffy ducks, happy cows, cheerful chickens. I definitely got a few warm fuzzies inside - that's never happened to me at a fast food joint before. I loved being reminded about all the animals I was saving by living/eating vegan. I hope veg-curious folks will have the same feeling. Customer service: five stars. Friendly and welcoming. We were even given 10% off since we were the first customers and might have to wait a tad longer than normal for our food. Nice. But really, the wait wasn't even bad at all. I didn't mind waiting for my food at all because I was not in a hurry to leave. BDJ is a friendly spot - I was impressed, to say the least. There was a very steady flow of curious people walking by BDJ who popped their heads inside to check it out. New Yorkers are such a curious bunch. Folks would step inside, do a 360 spin to check out the interior, grab a menu and leave. So enough about my delicious day - lets get to the food! 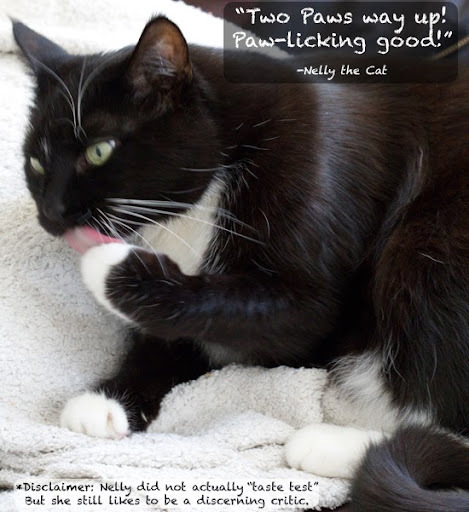 And my taste test review. The Blossom Du Jour Menu. 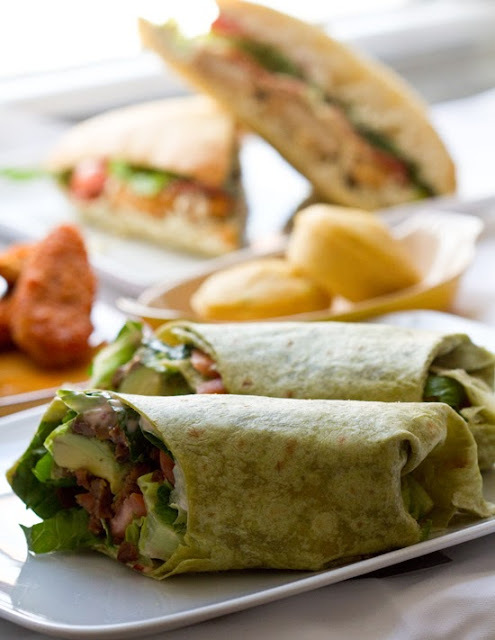 The menu sections: sandwiches, wraps, comforts, raw, salads, taco Tuesdays, soup du jour, sides, sweets and TRu Life Juices. 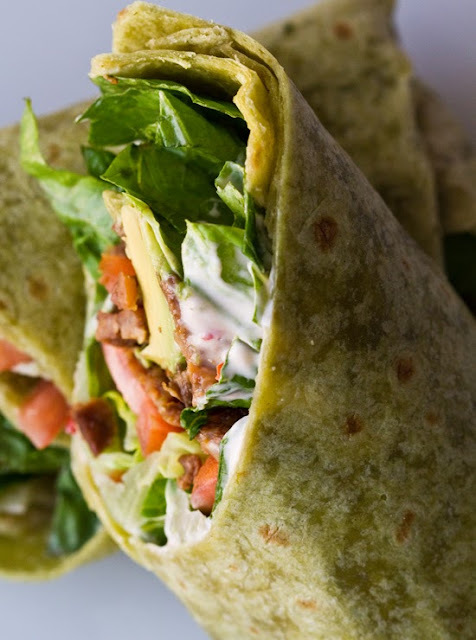 Smoky Avocado Wrap: A soft fresh green tortilla wrap surrounded fresh crunchy lettuce, juicy tomato, avocado, tender bits of smoked tempeh and a bold chipotle aioli sauce. I loved it! 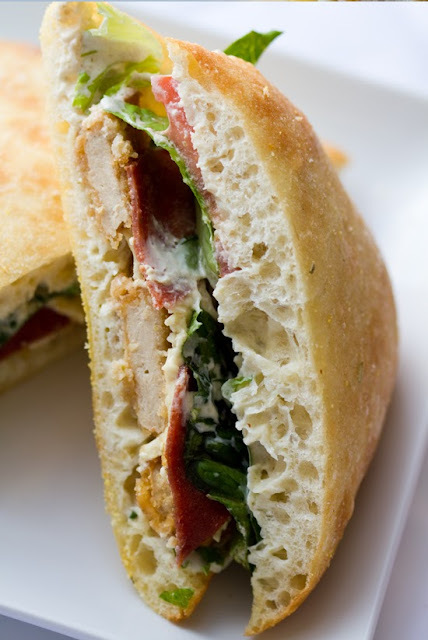 Moist, flavorful and fresh. I wish there had been a tad more tempeh, but overall it was awesome. 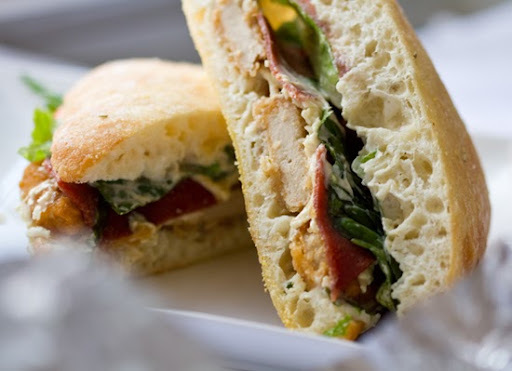 BLT Caesar Sandwich: A soft, fresh ciabata-style bun hugged creamy caesar-dressed layers of crispy un-chicken, soy bacon, lettuce and tomato. Moist, fresh and a zesty. ..side note: they really shouldn't call this fast food - because it is soooo much better than fast food. Buffalo Bites: Loved these! These were probably the most flavorful spicy vegan "un-chicken" tenders I have ever tasted. Moist to bite and spicy to perfection. The side dipping sauce was out of this world. 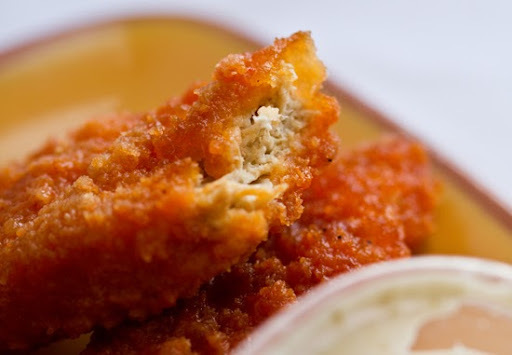 ..Bring a plate of these to your fave mainstream bar or weekend sports/beer-fest and I promise you the non-vegans will be clamoring for these babies. 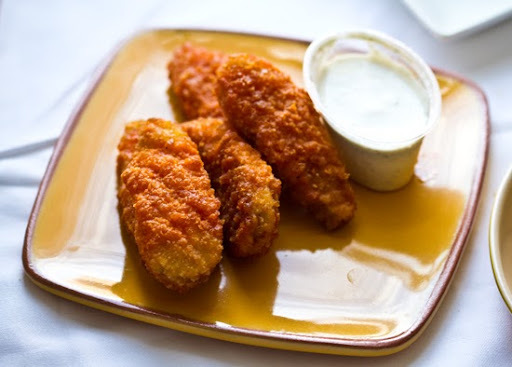 Hmm, maybe Blossom's next venture should be a sports bar featuring these buffalo bites. 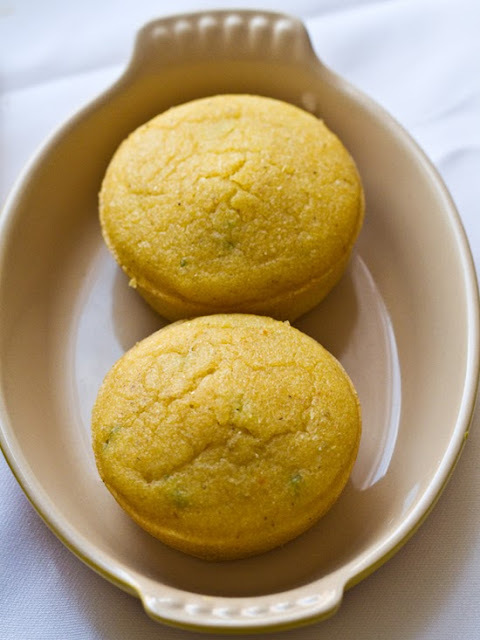 Jalapeno Corn Muffin: Simple, clean, tasty. I was expecting a bit more heat from this muffin, but it was a sweet little nubbin of yumminess anyways. This muffin would go great with a bowl of hot Soup Du Jour. 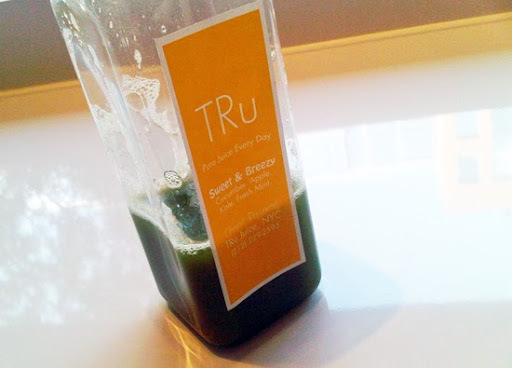 TRu Life Juice: Delicious juice. Clean, light, fresh. I chugged my green juice as we awaited out order..
Now let's check in with what nelly thinks.. Conclusion: So excited about this new spot! Both my husband and I loved our food. We chatted about how we are hoping we are within delivery range! 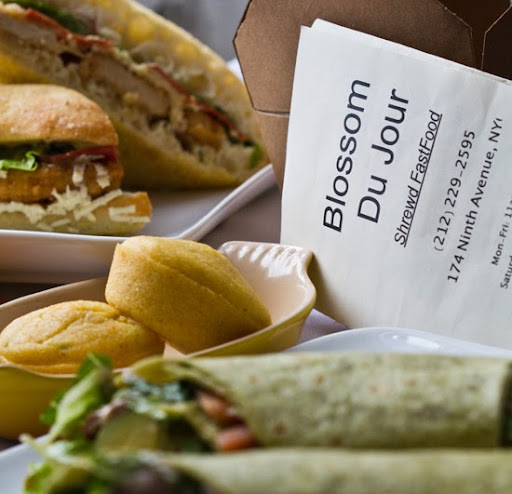 I could eat Blossom Du Jour's food for lunch or dinner. 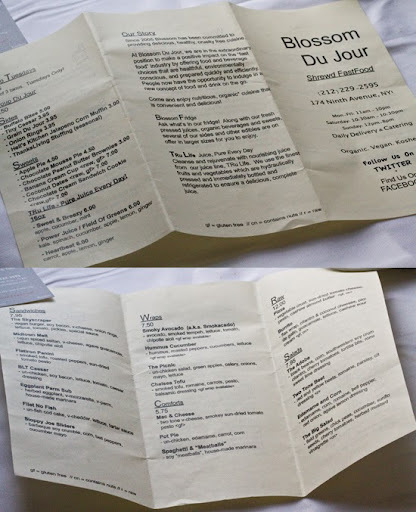 And compared to other vegan casual style restaurants in NYC - Blossom Du Jour's prices are pretty spot on. 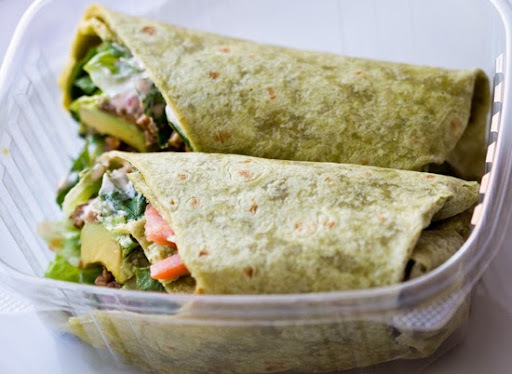 $7.50 for a giant delicious vegan wrap, made with love, is a deal I will be snagging. shrewd (shrood) adj. shrewd·er, shrewd·est - 1. Characterized by keen awareness, sharp intelligence, and often a sense of the practical. 2. Disposed to artful and cunning practices. The Big Question: Does Blossom Du Jour live up to it's tagline?.. "Shrewd Fast Food"
It doesn't merely live up to it. It exceeds it. 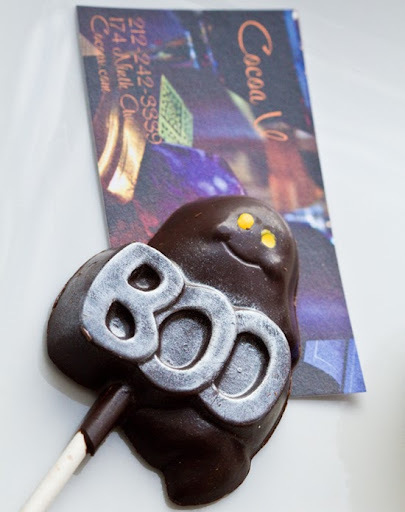 And just next door to BDJ is Cocoa-V for your sweet tooth..
Craving more NYC vegan dining ideas: NYC vegan dining spots - Top 20, ranked by me.